I thought I would start something new around here and post a list of Freebies I have found every Friday. There is nothing I love more than getting a mailbox full of surprises each day, this list of free samples and items every week will be a selection that I found all over the Internet and should help you learn about new products while receiving some "fun" mail instead of just junk! Feel free to leave any other freebies you run across and that I missed in the comment section! On July 28th all day long, you can enter "THREE" at any Blockbuster Kiosk and get a free rental. McDonald's Stores across the nation are giving away a free McCafe Mocha today 6/25 only. Enter the Veria Sweepstakes and they will send you a free organic vanilla lip balm in 6-8 weeks. If you have a Lucy store near you, you can go here to print a form which can be taken to the store to receive a cute free pink active wear armband. Free sample of the Avril Lavigne Forbidden Rose Perfume here. 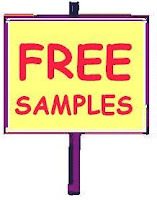 Email customerservice@worldofgreen.com your information to get a free SoyClean BBQ cleaner sample. eb5 has a great facial cream you can get a free same of here. Crafty readers can get a free sample of IdeaPaint which turns any surface into a dry erase board. You can get a whole free bottle of Country Bob's BBQ sauce. Free two packet sample of Kraft Sandwich Shop Mayo . Sample of Nivea Happy Sensation Daily Lotion. Enter ENJOYYOURSUMMER to get 10 free Pampers Gifts to Grow Points. Free samples of new U brand by Kotex . Get a Poise Free Sampler Kit here. Pair of free scissors with the MailFinity logo. Get a free coffee mug as a 5th Anniversary gift from styleartandframe.com. I am a follower! Thanks very much for following me. Looking forwar do to reading your posts! I would love for you to be a new Fan of my page too. I am just starting at Facebook & could really use the support of a blogger friend! Thanks so much! Thanks for sharing the great offers, I just did a lot of the, :). Thanks for posting...lots of great offers listed here! Just wanted to share my .02 on the eb5 facial cream - I requested a sample earlier and received it last week - I'm hooked. I'm going to order some online!